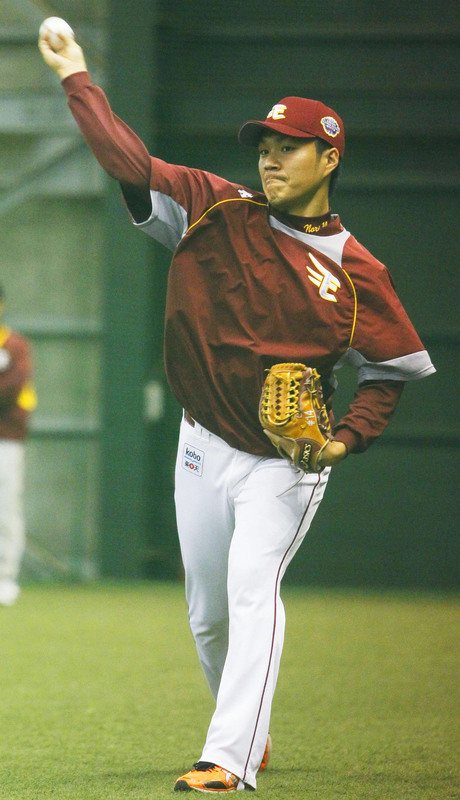 SENDAI - Rain kept the Tohoku Rakuten Golden Eagles indoors on Friday, but hasn’t dampened the enthusiasm ahead of their first Japan Series appearance, which comes against the storied Yomiuri Giants. He’ll have to wait if rain from the typhoon headed for Japan postpones the first game of the series, scheduled for Saturday night at Kleenex Stadium. The contest is currently expected to proceed as planned. Whenever the series kicks off, it will be rookie Takahiro Norimoto toeing the rubber for Rakuten, not Tanaka, the undefeated Sawamura Award favorite. 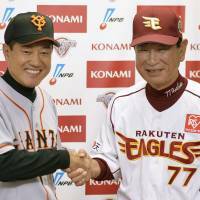 In a rare occurrence, Eagles manager Senichi Hoshino and Giants skipper Tatsunori Hara have agreed to announce their starters beforehand, and Hoshino will send Norimoto to the mound against Yomiuri lefty Tetsuya Utsumi in Game 1. 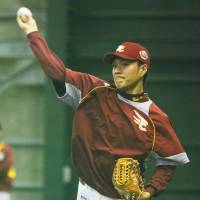 Norimoto had a solid rookie season for Rakuten, finishing 15-8 with a 3.34 ERA and 134 strikeouts in 170 innings. 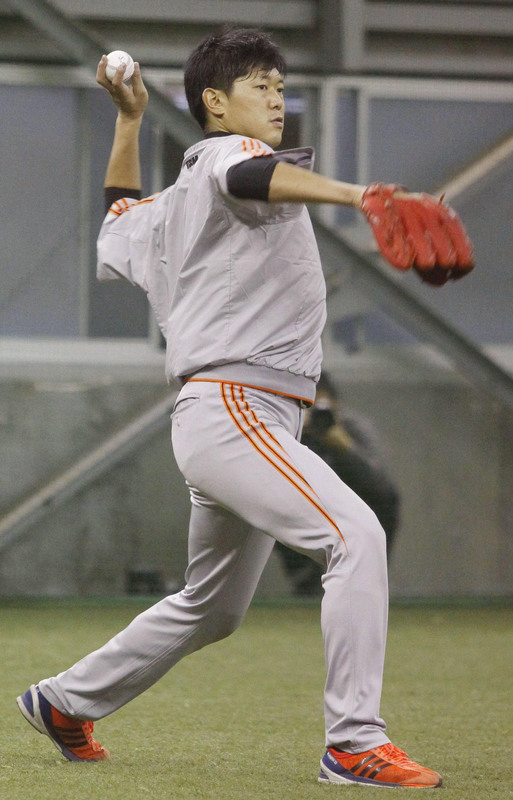 Utsumi, the 2012 Japan Series MVP, was 13-6 with a 3.31 ERA and struck out 107 in 160 1/3 innings for Yomiuri. Utsumi sounded a little surprised he wouldn’t be facing Tanaka, but quickly shrugged it off. Despite not getting the call in Game 1, all eyes will be on Tanaka when his turn comes around. The right-hander is coming off one of the best regular seasons in history, finishing 24-0 with a save, 183 strikeouts and a 1.27 ERA in 212 innings. 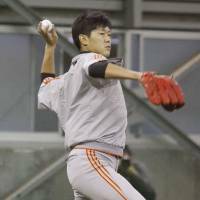 He threw a complete game against the Chiba Lotte Marines to win Game 1 of the Pacific League Climax Series Final Stage and recorded a save in the series finale. Tanaka went about his business as usual Friday, throwing a 34-pitch bullpen session. “I just did what I normally do,” he said. The Eagles say they feel confident no matter who they have on the mound. The Eagles expect to be able to feed off the emotions of what they hope will be an electric atmosphere at Kleenex Stadium. Rakuten hopes to give the fans a lot to cheer about in Game 1. “We want to be aggressive and win so that we can give some joy to the people in Tohoku,” infielder Ginji Akaminai said. The region has rallied around the Eagles’ run to the Japan Series, especially in light of the struggles many have faced after the Great East Japan Earthquake and tsunami that struck in 2011. “At the end of the day, it’s a baseball game, and hopefully it’s a sign of good things to come for the area,” McGehee said. “We’re here to entertain them (people from the affected areas) and hopefully make them feel good for a couple of hours. The Eagles are in the Japan Series for the first time after winning the Pacific League pennant, another first, and defeating the Marines in the Climax Series. It’s also the first trip to the title series for Andruw Jones, Rakuten’s celebrated offseason acquisition. Jones, a five-time MLB All-Star, appeared in two World Series with the Atlanta Braves (against the New York Yankees in both 1996 and ’99) but lost in both trips to the Fall Classic. They’ll need to do that, and maybe then some, against the defending Japan Series champions. 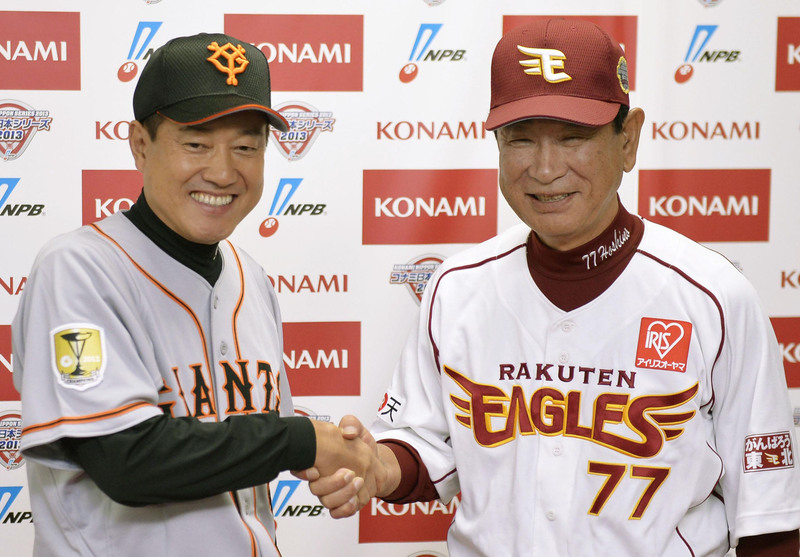 In stark contrast to the Eagles, the Giants are in the Japan Series for the 34th time and looking for title No. 23. The two teams split their four interleague meetings this year. The Eagles’ pitchers held their own against Lotte’s Tadahito Iguchi in the Climax Series, but the Giants bring more weapons to the table than the third-place Marines did. Shinnosuke Abe hit .296 with 32 home runs during the regular season and is perhaps the main threat in the Yomiuri lineup, though Shuichi Murata is coming off a strong second half, and hit .316 with 25 home runs for the Kyojin this season. Seven different Giants finished with at least 10 home runs this year. The Giants pose a threat anywhere they play, but are especially lethal at home in Tokyo Dome.